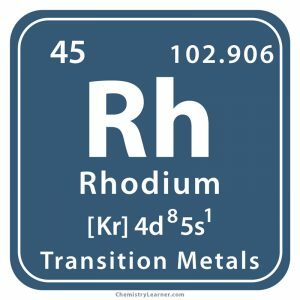 Rhodium (pronunciation RO-dee-em ), represented by the chemical symbol Rh , is a precious, highly reflective, corrosion resistant metal [1, 5] belonging to the platinum family . 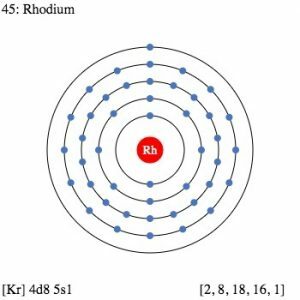 Naturally occurring rhodium has a single stable isotope with mass number 103 [1, 3]. It reacts with oxygen at very high temperatures and halogens but is inert towards water and acids . The rarest of all non-radioactive metals can be found uncombined in nature in the river sands of North and South America. It is also present in the copper-nickel sulfide ores of Ontario, Canada. 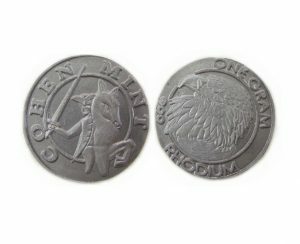 Commercially, it is obtained as a by-product of nickel and copper refining . Origin of Its Name: The name of the metal is derived from the Greek word rhodon meaning rose-colored, the color of its salts [1, 5]. Who Discovered It: English physicist and chemist William Hyde Wollaston [1, 5]. 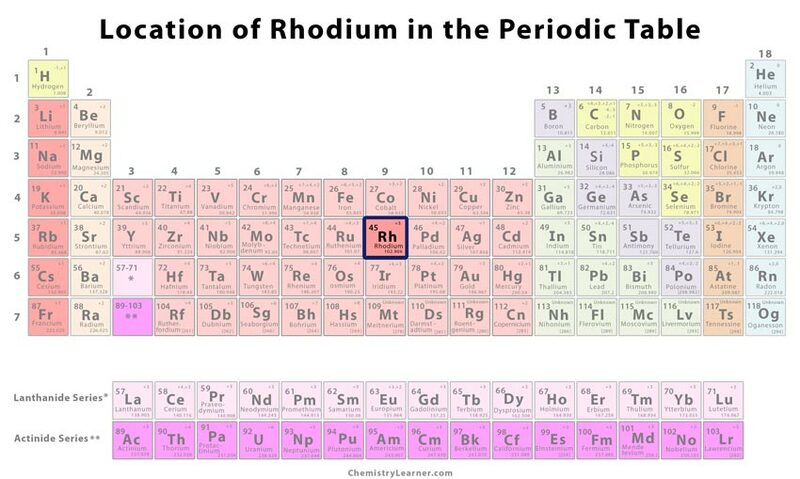 When Was Rhodium Discovered: Its discovery year is 1803 . 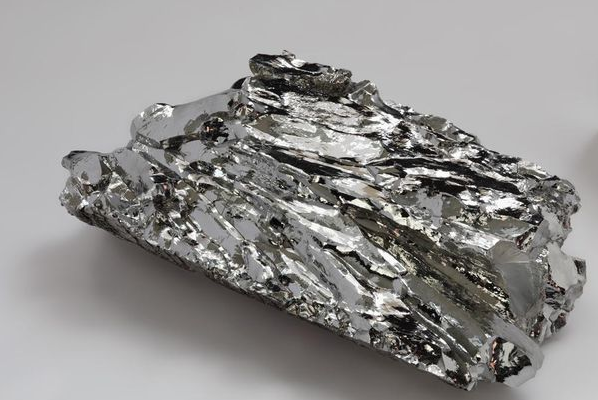 The element was discovered as a result of a collaboration between Wollaston and English chemist Smithson Tennant as a part of a commercial venture to synthesize pure platinum for sale. The first step involved dissolving regular platinum in aqua regia (a solution of nitric acid and hydrochloric acid). It didn’t dissolve completely and left behind a black residue that was later separated into osmium and iridium by Tennant. Wollaston took the solution containing the dissolved platinum and separated platinum and palladium from it by precipitation. He was then left with a red solution from which he obtained crystals of rose red color. 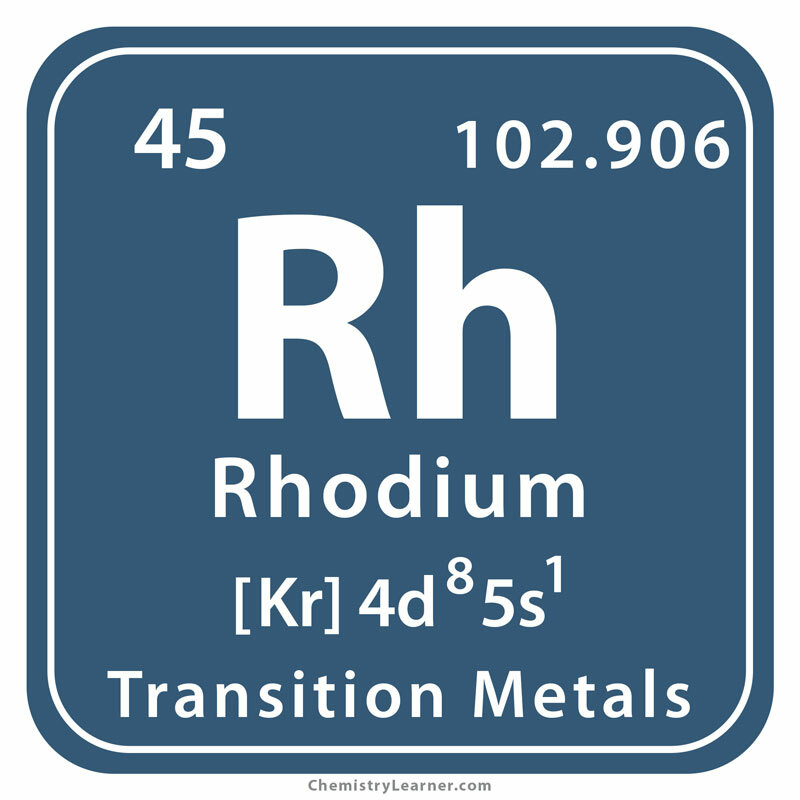 He found it to be sodium rhodium chloride that was eventually used to produce a sample of the metal itself . Its main use is in catalytic converters of cars where it reduces nitrogen oxides in exhaust gases . It is used as a catalyst in the chemical industry for producing nitric acid, acetic acid and in hydrogenation reactions . 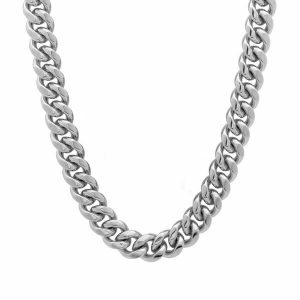 In some cases, it is alloyed with platinum in a gauze form, g. in the production of nitric acid by the Haber process . 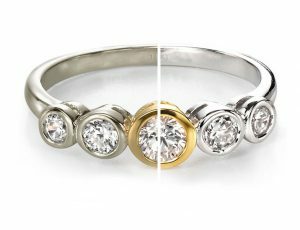 Rhodium electroplating, also known as rhodium dip or rhodium flashing, on (sterling silver, white/yellow gold, brass) jewelry protects their surfaces from scratches and tarnish, is hypoallergenic  and give them a white, reflective look . 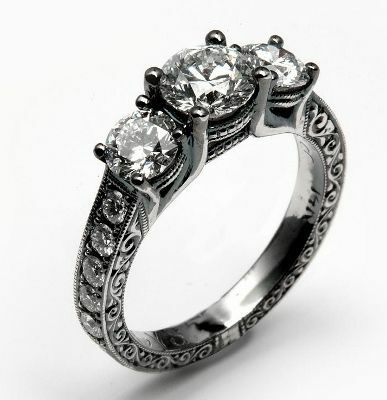 However, the deep gunmetal finish of black rhodium plated jewelry is also popular . It is used for coating optic fibers and optical mirrors  and also finds application in thermocouple wires (along with platinum). 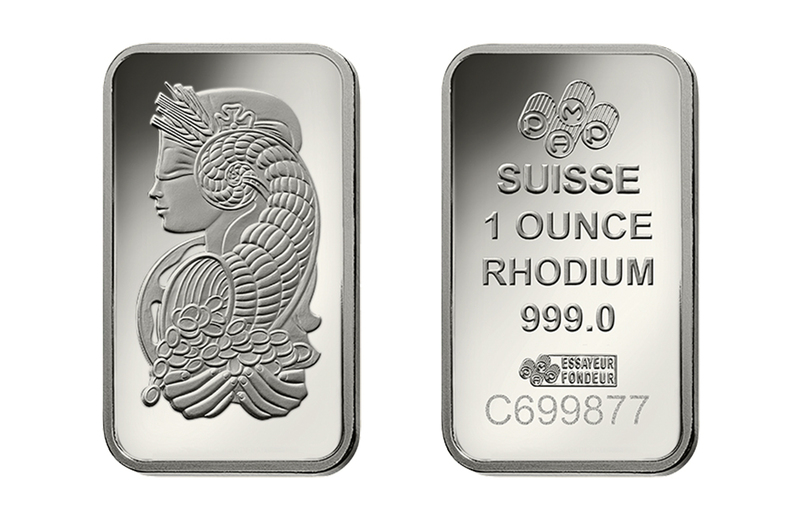 Rhodium, when used for industrial purposes, may pose a health risk as its compounds are toxic and carcinogenic. Hence it needs to be handled with care. Same goes for rhodium dust as it is flammable. 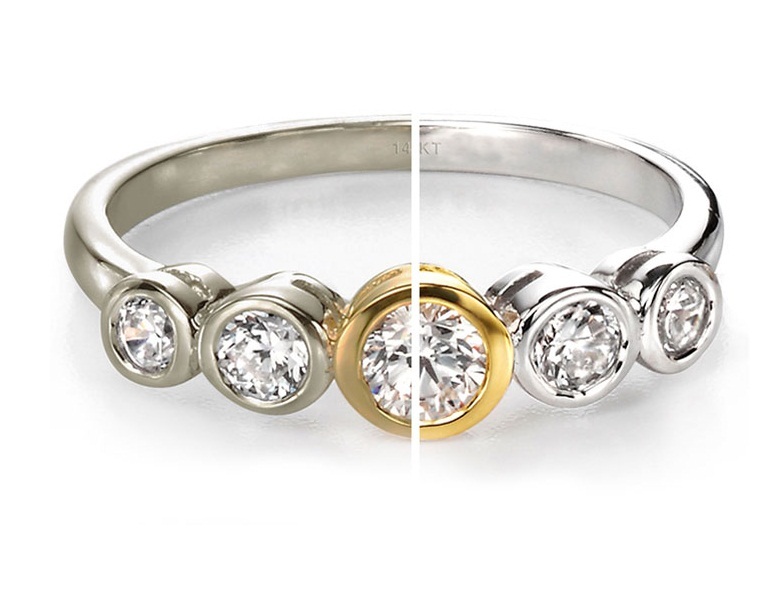 However, it is safe to wear rhodium plated jewelry as it prevents skin irritation . The yearly production of the metal in the world is just about 30 tonnes per year . 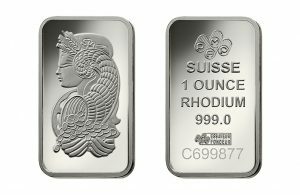 Though its price fluctuates, pure rhodium usually costs around $13,000 per 100 gram while rhodium in bulk costs $7,000 for every 100 gram. The rarity of the metal makes it so expensive .